At Badgerbrook we take ‘online safety’ extremely seriously. This video highlights the potential dangers of children chatting to strangers on chatrooms. Play video – Please view and discuss with your child/ren. 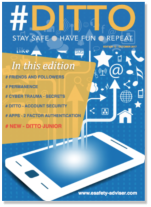 Here is a link to the latest edition of DITTO (Internet Safety Magazine). #DITTO is a free online safety (e-safety) magazine for schools, organizations and parents. Designed to keep you up to date with risks, issues, advice and guidance related to keeping children safe online, with a view to enjoying and learning about technology. A new edition is released approx. every 6 weeks. Ditto is published by e-safety advisor; a non-profit making organisation working to help make the Internet a great and safe place for young people. It has a range of leaflets for parents and children in a number of different languages. The Child Exploitation and Online Protection Centre maximises international links. Its approach combines police powers and the dedicated expertise of business sectors, government, specialist charities and other interested organisations to tackle internet abuse. Kooth is a service from Xenzone, leaders of online counselling. Young people can chat to friendly counsellors, read helpful articles and get support from online forums. All hot topics are covered including mobiles, blogging and gaming sites – and users can tell someone via the site if they feel uncomfortable or worried about someone they’re chatting to online.